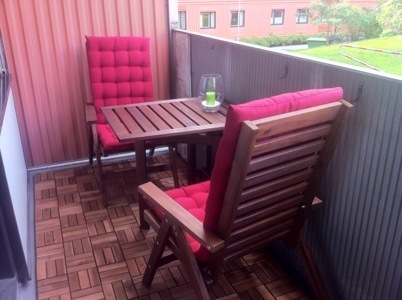 We’re finally done with our balcony and it’s looking fantastic! We bought too few wood tiles though so we need to go back to get more sometime in the near future. The funniest thing though is that we need to return the serving cart. Reason? 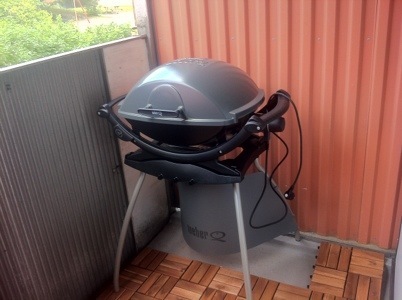 We had planned to use it as a stand for the Weber electrical grill we had found but when we went to the store to buy it we found a bigger version of the same grill which actually had a stand already so now we don’t need the serving cart after all. We figured that out Sunday evening already after we bought the grill so we never opened the box. I have a work event tonight and Mathias has one tomorrow so the first time we’ll use the grill and eat on the balcony will be on Friday! I hope the weather cooperates.